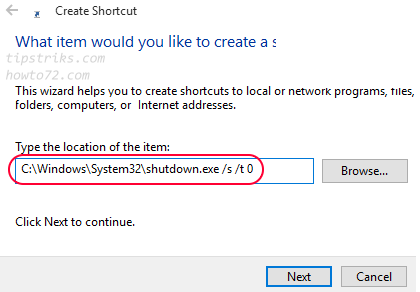 You can shutdown a Windows 10 computer in various ways, from the menu already provided in Windows itself or you can make a shortcut for faster and easy click. 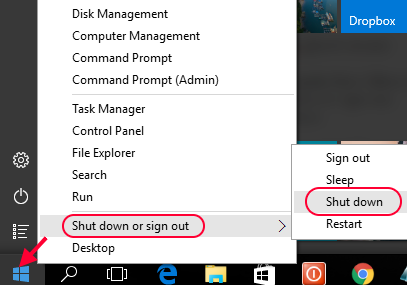 Here are 6 ways to shutdown in Windows 10 computer. 1. Click on the Start Menu (Windows logo) or press Windows key on the keyboard. Way 2. Through the Quick Access menu. 1. Right-click on the Start Menu (Windows logo, bottom left corner). 2. 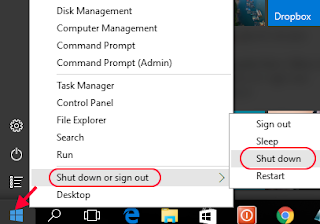 Click Shutdown or sign out. The Alt+F4 serves to end the running program, for example if you are opening MS. Word then press Alt + F4 then MS word application will exit. To shutdown Windows with pressing Alt+F4, other programs that are active must be in minimize state first. Physical power button on the outside/on the front of the computer/laptop. This is the fastest and easiest way to turn off the computer, because it's only need a one-step. To shutdown using this way, first we have to set the power button option to doing shutdown when it is pressed. because usually the default from factory by pressing the power button is going to Sleep. 1. Click the search icon at the bottom left corner of the screen, or press the Windows key on the keyboard and then type : power plan, then you will see at the top 'Choose a power plan,. 2. 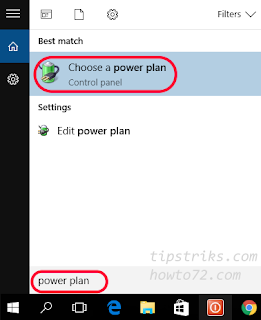 Click on Choose a power plan. 3. Then the Power Options window appears, Click on Choose what the power button does. 4. 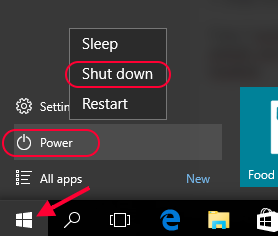 On the When I press the power button option, dropdown and select Shutdown. (for laptop there are 2 columns must be chosen, when using battery and when using electricity). 5. Click Save changes to save the setting. 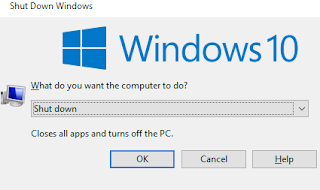 Now when the power button is pressed, then the computer will immediately shutdown, if there are documents that have not been saved then Windows will notify before. Way 5. Shutdown through Run command. If you're lazy to use the mouse, you can use the run command, this way also is a quick way when you get used to it. 2. Type at the column: shutdown /s /t 0 then press Enter. (shutdown space slash s space slash t space 0 ). /t 0 means for immediately shutdown. 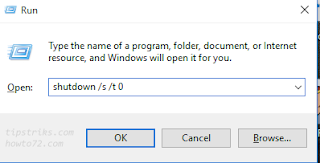 After pressing the Enter key, the computer will shutdown immediately but it will give a warning if there are unsaved documents. Way 6. 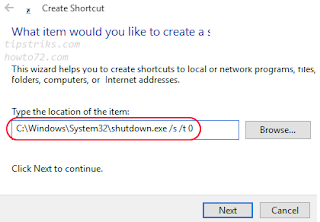 By creating Shutdown shortcut on the Desktop. This way is also easy and fast, because only one step or one-click. 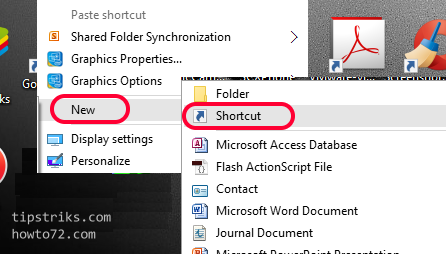 Clicking on the shortcut that is put on the Desktop or on Quick launch. 1. Right click on empty area of ​​desktop then choose New> then select Shortcut. 2. Type shutdown /s /t 0 in the Type the location of the item field. then click Next. Give a label name or let it be, then click Finish. 3. 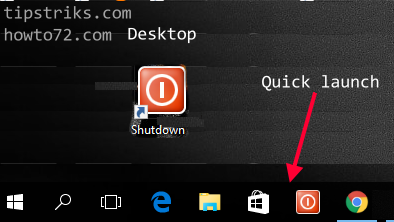 On the desktop you can see the shortcut shutdown now. The last if you want, change the icon to power button icon. Right click on the shutdown shortcut then click Properties, will display the shutdown properties. Then click on Change Icon. 4. 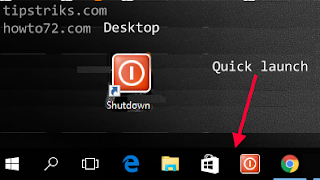 Choose and select the icon, then click OK.
Now the shutdown shortcut with its icon is ready on the desktop. you can also send the shortcut to the Quick launch. That's 6 ways to perform shutdown in Windows 10. Also some steps apply to Windows 8 and 7.